Huawei has surpassed Apple and secured the second position in the global smartphone market, reports IDC for the second quarter of 2018. The Chinese smartphone giant secured a market share of 15.4% by shipping 54.2 million headsets and in this process overtook Apple as the second biggest manufacturer of smartphones. Huawei had a 41% increase in unit sales year on year. 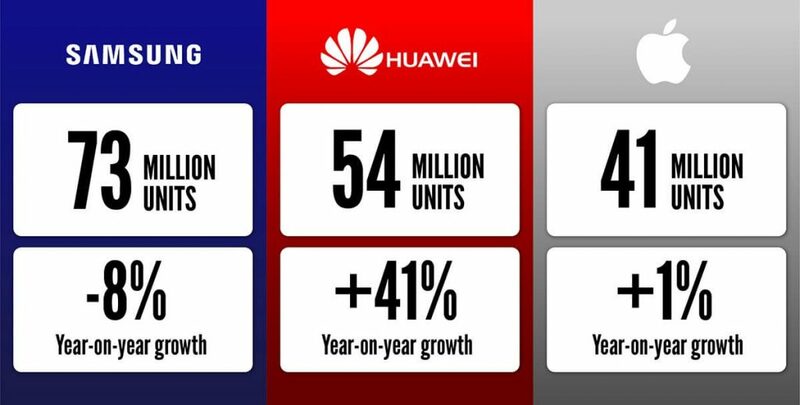 In July 2018, smartphone sales of Huawei mobile sets crossed 100 million. The Mate line-up represents the absolute best the company has to offer with all the premium features and hardware, while the Nova and P series are catered towards the budget market. Huawei recently took the smartphone world by storm when it introduced the Huawei P20 Pro which decimated all previous smartphone cameras and registered a new record on the DXO camera bench-marking website. Huawei was the first in line to introduce a rear triple camera set-up on the P20 Pro. The phone received good reviews from all over the world. The smartphone manufacturer adopted Neural Processing Unit (NPU) in order to blend AI experience in the camera set-ups. The secret of Huawei’s success is due to its consistent and massive investments in research and development. Huawei invests over 10% of its revenue in R&D every year. The European Commission’s 2017 EU Industrial R&D Investment report ranked Huawei at No. 6 among all the multinational tech-companies in terms of R&D investment. According to Huawei’s 2017 annual report, 80,000 of its staff members worked for R&D, taking 45% of the total number of employees. Huawei in recent times has built world-leading hubs of expertise, including UX design center in San Francisco, design center in London, aesthetic center in Paris, and 5G technology development center in Germany. The company has a total of 36 innovation centers for R&D, worldwide. In 2017 Huawei invested 10.4 billion euros in R&D, this accounted for 14.9% of the company’s total revenue. Samsung Galaxy S8 Rumors: What Features to Expect? Samsung Galaxy S9 to Beat the Apple iPhone X?